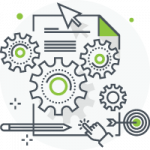 At Searchmetrics, the software we produce to help customers rank online is as important as the people on our team who can help you make sense of it all. 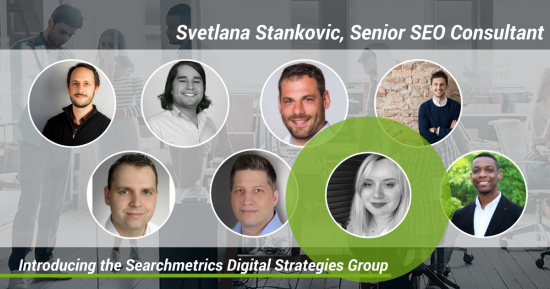 As we launch the new Searchmetrics Digital Strategies Group, we talked to one of our SEO consultants and content strategists making up the core of the European and US teams about the state of digital marketing, current conditions and challenges modern marketers face. 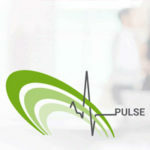 She tells us in this Pulse what she’s learned from working with our clients and our Searchmetrics Content Experience and Search Experience software. How well is digital marketing generally established today? Svetlana: Digital marketing is somehow a buzz word in business circles, and everyone uses it, but the general knowledge about strategic and data-driven digital marketing is unfortunately still not on a very high level. Traditional industries are using social media management and paid online advertising by the name of digital marketing, but too many times we see they lack information about industry trends, search engine optimization and content created for different buyer personas. We still have a long way to go to be able to show that digital marketing has grown up as a discipline. Nowadays, all marketing should be digital, so we cannot separate it from traditional marketing; we must incorporate it instead. Svetlana: Focus on the data! Collect as much information as you can: take your time to conduct research about customers, industry, search trends, online behaviour, competition techniques, etc. To find out what really works for your business, always start from the basics, creating a minimal viable product (MVP) and measure and test everything in the early stages. This should give clear insights in which direction your business needs to go, and what marketing channels should be used. You don’t waste too much time and ressources on underperforming channels. 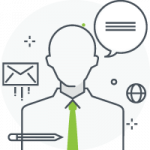 In general, your customers are your best consulting experts. Create quality content, optimise the website and test and measure paid channels, but always focus on feedback. Be ready to track, measure and change everything, even starting from the beginning if channels are not performing and not showing ROI. 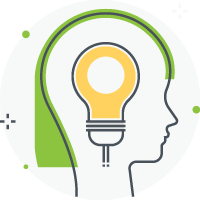 Many in-house experts believe they have challenges in advocating for larger budgets and choosing the right strategy and approach, but the main trouble is having no will to change things, and even less to learn from the past mistakes. If you are an in-house expert, be a proactive visionary leader and stay open to all new things on the horizon, whether it’s creating content for voice search, getting different manpower in your team, or simply building everything from scratch if your current strategy is not giving results. What is your advice for inhouse marketers? Which challenges are marketers commonly facing? 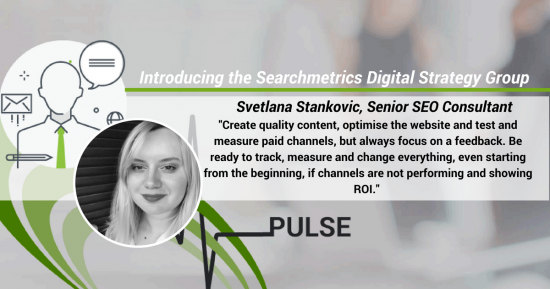 Svetlana: The good news is that a lot of in-house marketers are already extremely advanced in terms of digital tactics and know their tools of the trade. Most companies also got to the point already, where they have built teams which cover the main columns of a digital strategy in terms of knowledge. What’s often lacking is the general implementation of digital marketing within an organization. A lot of companies are not yet at the point, where the impact of search and content marketing is fully understood. In a lot of cases, this simply is a result of the reporting structure and KPIs measured. Either there is not enought time spent on the reporting or the KPIs are set up in a way that in they can’t ultimately be connected to the revenue that actually comes from the different initiatives, which can leave a lot of hard work unrecognized. Some challenges, which can have just as abig impact occur in the day-to-day groundwork, both on the creative and the technical side. Regarding the latter, small technical issues can cause a huge decrease in the overall performance – while outsourcing content creation to budget-friendly freelancers or agencies might sound like a good idea at first but is predestined to spawn results that are rather user-hostile. 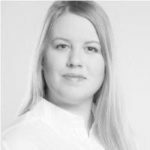 Lea was part of the Global Communications team and responsible for the Searchmetrics Social Media channels and marketing cooperations. Read all of Lea's post about digital marketing news, events, recaps and trends here.